اتلستن (اینگیلیسی‌جه: Æthelstan) بیر شاهزاده ایدی. ۹۲۴–۹۲۷ ایل‌لر آراسیندا حؤکومت ائدیب. آتاسی ادوارد پدر دیر. ادوارد پدر اؤلوموندن سوْنرا حؤکومتی اله کئچدیب. Bailey, Maggie (2001). "Ælfwynn, Second Lady of the Mercians". In N. J. Higham & D. H. Hill. Edward the Elder 899–924. Routledge. ISBN 0-415-21497-1.
Cooper, Tracy-Anne (March 2013). «Æthelstan: The First King of England by Sarah Foot (review)». Journal of World History 24: 189–192. DOI:10.1353/jwh.2013.0025. یوْخلانیلیب9 December 2013. Halloran, Kevin (September 2013). «Anlaf Guthfrithson at York: A Non-existent Kingship?». Northern History 50: 180–185. DOI:10.1179/0078172X13Z.00000000042. Hart, Cyril (1973). «Athelstan 'Half King' and his family». Anglo-Saxon England 2: 115–144. DOI:10.1017/s0263675100000375. Keynes, Simon (1985). "King Æthelstan's books". In Lapidge, Michael; Gneuss, Helmut. Learning and Literature in Anglo-Saxon England. Cambridge University Press. pp. 143–201. ISBN 0-521-25902-9. Keynes, Simon (1999). "England, c. 900–1016". In Reuter, Timothy. The New Cambridge Medieval History III. Cambridge University Press. pp. 456–484. ISBN 0-521-36447-7. Keynes, Simon (2001). "Edward, King of the Anglo-Saxons". In N. J. Higham & D. H. Hill. Edward the Elder 899–924. Routledge. ISBN 0-415-21497-1. Keynes, Simon (2001). "Rulers of the English, c. 450–1066". In Michael Lapidge, John Blair, Simon Keynes and Donald Scragg. The Blackwell Encyclopedia of Anglo-Saxon England. Blackwell Publishing. ISBN 978-0-631-22492-1. Miller, Sean (2001). "Æthelstan". In Michael Lapidge, John Blair, Simon Keynes and Donald Scragg. The Blackwell Encyclopedia of Anglo-Saxon England. Blackwell Publishing. ISBN 978-0-631-22492-1. Nelson, Janet (2008). "The First Use of the Second Anglo-Saxon Ordo". In Julia Barrow and Andrew Wareham. Myth, Rulership, Church and Charters. Ashgate. ISBN 978-0-7546-5120-8. Roach, Levi (August 2013). «Law codes and legal norms in later Anglo-Saxon England». Historical Research 86 (233): 465–486. DOI:10.1111/1468-2281.12001. Scragg, Donald (2001). "Battle of Brunanburh". In Michael Lapidge, John Blair, Simon Keynes and Donald Scragg. The Blackwell Encyclopedia of Anglo-Saxon England. Blackwell Publishing. ISBN 978-0-631-22492-1. Sharp, Sheila (Autumn 1997). «England, Europe and the Celtic World: King Athelstan's Foreign Policy». Bulletin of the John Rylands University Library of Manchester 79: 197–219. Sharp, Sheila (2001). "The West Saxon Tradition of Dynastic Marriage". In N. J. Higham & D. H. Hill. Edward the Elder 899–924. Routledge. ISBN 0-415-21497-1. Stafford, Pauline (2001). "Ealdorman". In Michael Lapidge, John Blair, Simon Keynes and Donald Scragg. The Blackwell Encyclopedia of Anglo-Saxon England. Blackwell Publishing. ISBN 978-0-631-22492-1. Thacker, Alan (2001). "Dynastic Monasteries and Family Cults". In N. J. Higham & D. H. Hill. Edward the Elder 899–924. Routledge. ISBN 0-415-21497-1. Williams, Ann (1991). 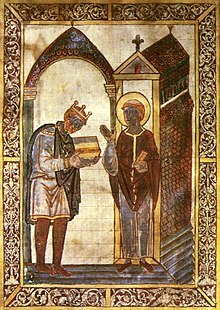 "Athelstan, king of Wessex 924-39". In Ann Williams, Alfred P. Smyth and D. P. Kirby. A Biographical Dictionary of Dark Age Britain. Seaby. ISBN 1-85264-047-2. Williams, Ann (1991). "Ealdred of Bamburgh". In Ann Williams, Alfred P. Smyth and D. P. Kirby. A Biographical Dictionary of Dark Age Britain. Seaby. ISBN 1-85264-047-2. Wood, Michael (20 August 2013). Aethelstan: The First King of England. King Alfred and the Anglo Saxons (3). BBC 4 Television. Woodman, D. A. (December 2013). «'Æthelstan A' and the rhetoric of rule». Anglo-Saxon England 42. Wormald, Patrick (1999). The Making of English Law: King Alfred to the Twelfth Century 1. Blackwell. ISBN 0-631-13496-4. Yorke, Barbara (2001). "Edward as Ætheling". In N. J. Higham & D. H. Hill. Edward the Elder 899–924. Routledge. ISBN 0-415-21497-1. ویکی‌آمباردا Æthelstan ایله مربوط فایل وار. Athelstan. The Essay: Anglo-Saxon Portraits. 11 April 2013. بۇ صفحه‌‌ سوْن دفعه ‏۲۲ نوْوامبر ۲۰۱۸، ‏۰۸:۵۶ تاریخینده دَییشدیریلمیشدیر.